Here is a look at the Air Jordan 18 Red Suede 'Toro' Sneaker Available HERE at Ruvilla, HERE at Nike & HERE at DTLR. In 2003, MJ played his final minutes on the court. 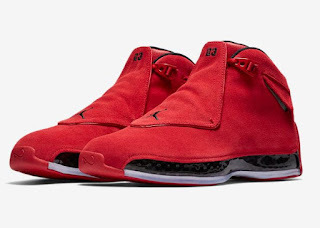 The Air Jordan XVIII was the last of the signature line he would lace up. In a tradition that went all the way back to the beginning, the shoe featured exquisite craftsmanship and wore its sports-car inspiration on its shroud. Now it returns in a style befitting Jordan royalty, sporting luxe suede and Chicago colors.